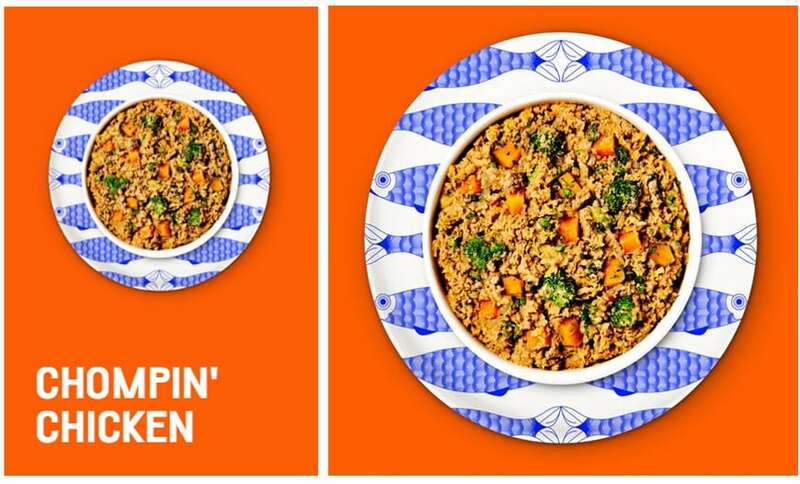 While there’s only three recipes to choose from, PetPlate’s high quality ingredients and ready-to-eat containers steal the show. PetPlate.com is a quality subscription dog food delivery service that focuses on creating customized meals for your dog. Each meal is tailor-made based on the specifications that your yourself provide about your pet, and then delivered straight to your door eliminating the need for the constant pet shop runs many of us have grown accustomed to. Pet Plate was founded by Renaldo Webb, a consultant in the pet food industry who immediately noticed the inferior ingredients and substandard processes used to make mass-market pet food. My first order of Pet Plate arrived in a large brown box on a hot sunny day while I was at work. Naturally, all I could think was “I sure hope this stayed cold!” After opening the box, I was amazed at how cold everything stayed. There was absolutely no chance of this spoiling any time soon. The containers are super convenient – but make sure you recycle! I started with the trial order of the chicken and beef recipes. 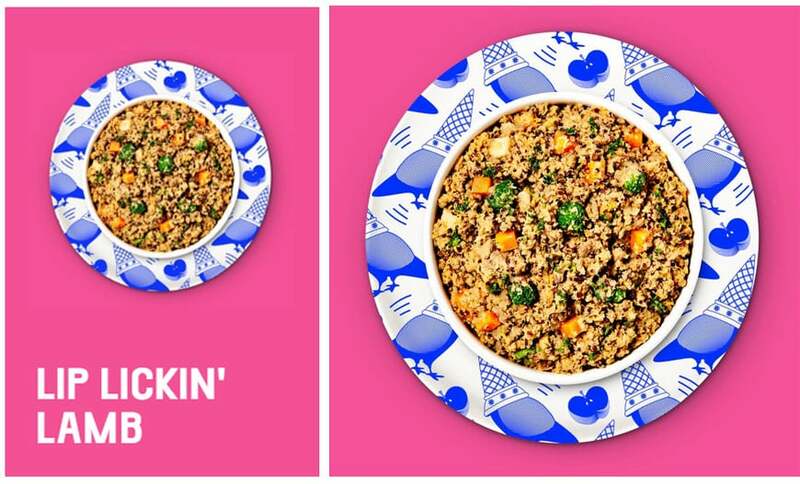 You can see in the photo here that Pet Plate is very unique in terms of product packaging. Each individual meal is in its own container, making feeding times super simple. 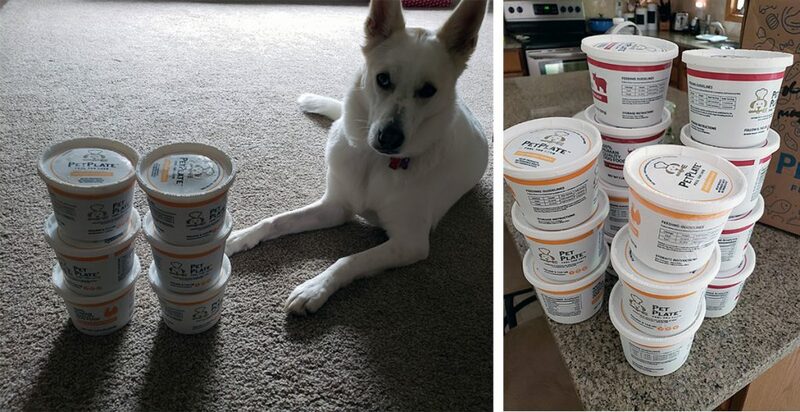 If you’re like me and feed your dog twice per day instead of all at once, you can just empty half of the container out into their bowl in the morning and then give them the rest in the container for dinner. Sasha thinks she’s getting a special treat by being able to eat it right out of their bowls! One final point I’d like to mention while we’re on the topic of unboxing your first Pet Plate order. Please remember to freeze the majority of the food. In most cases, if you place it all in your refrigerator, some of it will spoil before your dog eats it since this is real, fresh food. What I do is freeze all of it but two containers; put those two in your refrigerator and every day when you finish one, take another our of the freezer and into the fridge to thaw. One of Pet Plate’s best features is the fact that pet owners are fully aware of every single ingredient that is going into their pet’s meal, removing any concern about those mystery products on the labels of the bigger name brands in the market today. And not just that, but because each meal is pre-portioned by the company, pet parents can rest assured that they won’t be overfeeding their pup. And for those curious about where Pet Plate gets its food, it is entirely American made and packaged at a human grade, USDA inspected facility in upstate New York. The company also promises that no by-products ever find their way into their products, and every recipe and formula is specially designed by a team of veterinarians and nutritionists and then cooked in small batches by trained pet chefs to conform with rigid company standards. 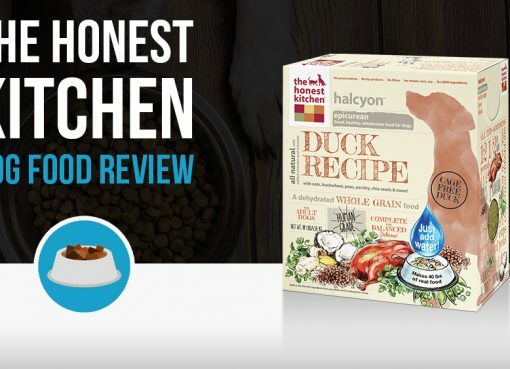 These exact standards are how we reviewed and rated dry dog food manufacturers to find the list of best dog food, so it’s great to see Pet Plate’s delivery service matching that high level of quality. 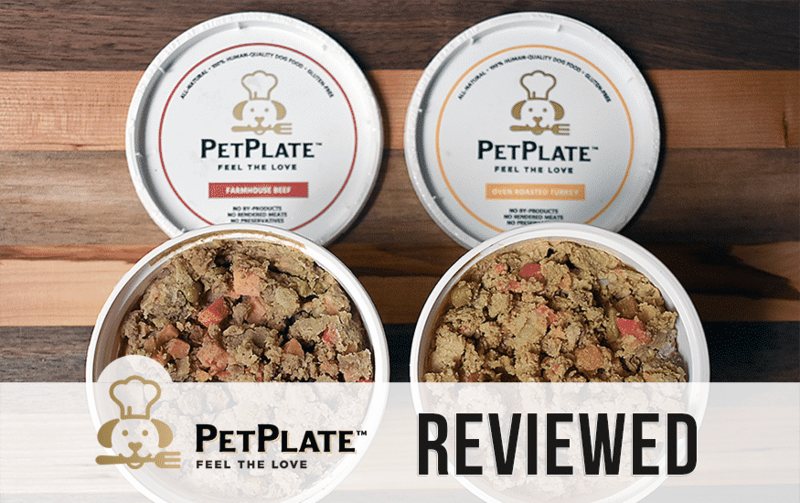 At the time of this review, Pet Plate has 4 excellent recipes to choose from. Let’s take a look at each recipe’s full ingredient list and our calculated estimated nutrient analysis. Pet Plate’s chicken recipe is their most popular and all around has a great nutrient profile. It has the second highest protein among their available recipes along with the second highest carbs. But don’t let that scare you – these carbs come from some great ingredients such as sweet potatoes. The Barkin’ Beef recipe (don’t get this confused with Grocery Pup’s Bitchin’ Beef!) has the highest fat among their recipes, but still nowhere near the levels that NomNomNow has. High fat foods can help maintain healthy coats and skin. Their lamb recipe had surprisingly low protein levels in it for being a fresh dog food. AAFCO recommends 26% minimum protein for puppies, so it is still above all required standards. Having a lower-protein option among fresh dog food companies is actually refreshing to see, because not all dogs do well on high protein diets. Pet Plate’s turkey recipe has, without a doubt, a very high protein count. This recipe is the highest protein and also lowest carb ratio of all recipes. She would lick the bowl all day if it were up to her. I like to preface taste test sections by saying my dog is not a picky eater, but it’s easy to tell when she absolutely loves something. And she absolutely loves Pet Plate. The quality is apparent just by looking at the food, with identifiable ingredients that even I would eat! 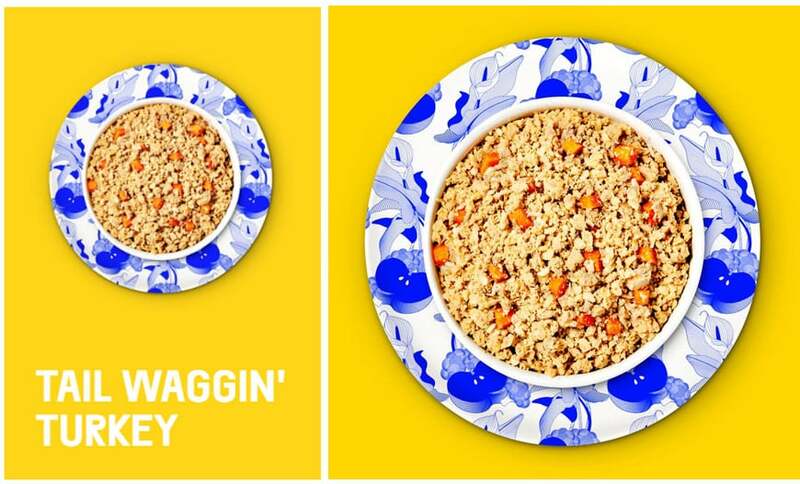 Note: If you are just switching to fresh dog food, it is important to make the transition slowly, especially if your dog is currently on a full kibble diet. 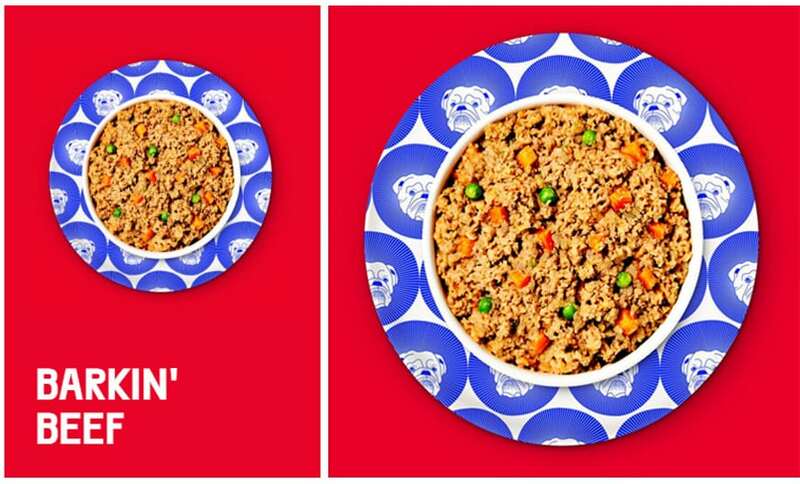 The drastic change can cause upset stomachs; luckily, Pet Plate offers great instructions on how much and how often you should feed during the transition period. 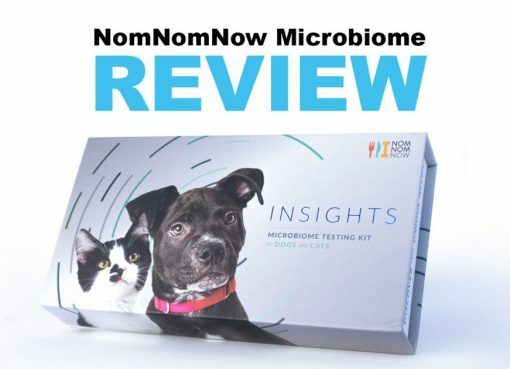 While the company doesn’t offer any samples at the moment, they do offer a $20 trial box for curious pet parents to test out that comes with two week’s worth of food. For those who do decide to make the move and start ordering, there is no set, standard price for the program and it all depends on the animal’s size and the ingredients chosen. The website does state, however, that meals can be purchased for as low as three dollars per day, and the price seems to go up from there. For a limited time, Pet Plate is giving Woof Whisker readers a huge discount that you can access through this link! Once you decide to start customizing your box, the process is pretty straightforward. The website first asks for your pets name and if it is a puppy or not, before moving on to asking about the dog’s weight. Once this information is entered into the system, users can then select either a turkey, half turkey/half beef, or all beef based meal, and chooses whether they want them to arrive every two weeks, or on a monthly basis. Interested pet parents can also click on each of the three formulas for more information, and can then simply click on the option selected and head to the checkout screen. Simple as that! We give Pet Plate two paws up! Need to know if this product needs refrigeration? I do not have enough refrigerator space. What is your return policy. I have the pickest Chihuahua ever. Only eats on certain days. Had her checked out, can’t find anything wrong with her. She is a little underweight. Hi Carol – yes these need to be refrigerated and frozen. When your package arrives, you only put one in the refrigerator at a time, and freeze the rest. Take one out of the freezer every time you finish a package from the refrigerator. This ensures they stay fresh.